Home Unlabelled What Does It Mean If You Have A Tendon That Sticks Out From Your Wrist? 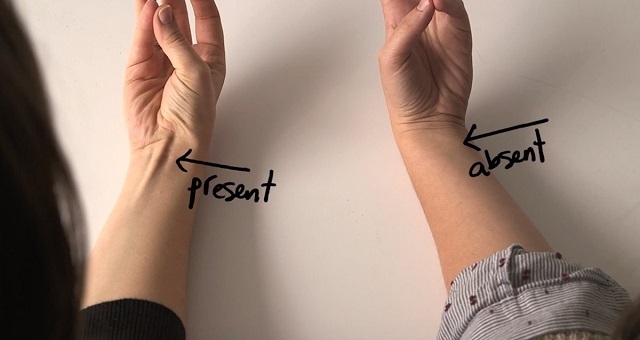 What Does It Mean If You Have A Tendon That Sticks Out From Your Wrist? Palmaris Longus is the small tendon seen as a muscle in the forearm of the human body. In 14% of the population this muscle is missing. In most cases, it is thought to be a leftover vestigial muscle that some of us inherited from humans’ early tree dwelling antecedents. Although there are a lot of people who do not have Palmaris Longus, they are not affected by this. They have the same grasp as those who still have this muscle, and they do not suffer from arm or hand weaknesses. Since the muscle lost its function over time, it is often removed or dissected by surgeons for performing surgeries that are in most cases reconstructive. There is another leftover from a very long time ago, basically occurring since the late 1800s onwards, other than the Palmaris Longus. Namely, in rare cases nowadays, human babies can be born with tail! The tail inside is built of muscles and there is no bone inside of it, so it can move. The operation for removing the tail is not complicated. Our antecedents used their tails to maintain balance. However, now we are able to move straight up and keep our balance without tails. Humans also have another very common leftover that is also vestigial. The arrector pili muscles are feature of every human body. The proof that you can notice it are the goose bumps that you get when you feel adrenaline rush, or you are cold. When you feel cold, these small muscles provide a kind of protection that causes the hair on the human body to stand upwards. However, with evolution this function has proven to last too short in order to be really effective by actually keeping our bodies warm. When there is adrenaline rush, the muscles act like a booster by trying to make us feel more powerful than our rivals. Another surprising leftover is the ability of some people to wiggle with their ears. Nowadays, animals wiggle their ears when they hear a sound, so that they could hear it and react to it accurately. It is more than likely that our ancestors used this ability for the same purpose. Certainly, with evolution, we do not have this ability anymore. The appendix, the tonsils and the wisdom teeth are another parts of the human body that have vestigial features. In the following video made by the Vox Observatory, you can learn more interesting things about the ear muscles that we do not make use of anymore, the palmaris longus muscle, the palmar reflex in infants and the goose bumps that we get in a specific mood. You can even find out if you belong to those 14% that lack the palmaris longus muscle!